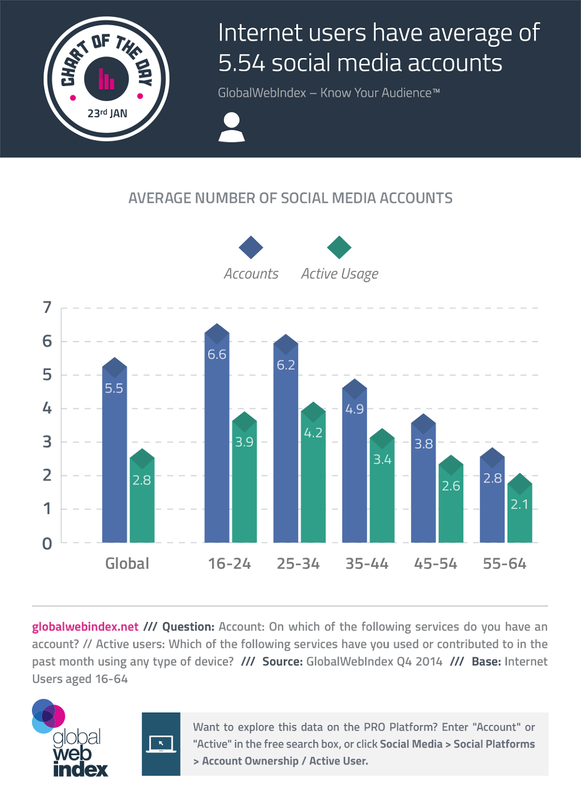 GlobalWebIndex’s survey monitors engagement with close to 50 named social platforms. This surveyed data allows us to calculate the average number of social media accounts per internet user – with the global figure being 5.54. People are actively using 2.82 social platforms – giving clear evidence that multi-networking behaviors are flourishing. Predictably, 16-24s are at the very forefront of this trend having an average of 6.55 accounts each; in contrast, 55-64s are maintaining accounts on just 2.85 services. 25-34s are now ahead of 16-24s, with the former being active on some 4.21 networks. Loyal to Facebook, this age group are the most likely to be using professional networks such as LinkedIn.